Since reform efforts failed in the 2017 legislative session, federal judges have called bail practices in Texas’ two largest counties unconstitutional — claiming the justice systems often keep poor people locked up for days or weeks before their trials while letting similar defendants with cash walk free. And more states, counties and cities are veering away from cash-based bail systems and leaning toward making pretrial jail release decisions based on an arrestee’s risk of posing a danger or skipping court hearings. Senate Criminal Justice Committee Chair John Whitmire, D-Houston, and state Rep. Andrew Murr, R-Junction, filed those bills in early February and seemingly sought to get the governor on board by including provisions that Abbott has backed, including having judicial officers consider the defendant's criminal history and the safety of law enforcement officers when setting bail, not just the current criminal charge. Most notably in a nod to the governor, they named their legislation the Damon Allen Act in honor of the Texas Department of Public Safety trooper whose murder pushed Abbott to call for change to bail practices last year. Allen was gunned down in a 2017 traffic stop as the man suspected of killing him was out of jail on a $15,500 bond after allegedly assaulting a sheriff’s deputy. A little more than a week ago, just before the bill-filing deadline, the senator submitted a second piece of bail legislation that matches Kacal’s bill, putting Whitmire’s name at the top of two bills named after Trooper Allen. Whitmire said last week that he had not talked to Abbott’s office about the new bills. Kacal confirmed to the Tribune that he worked with Abbott on his bill to "avoid tragedies like the death of Trooper Damon Allen in the future." A spokesperson for Abbott did not respond to multiple requests for comment on the issue. Although Kacal’s name is on the bill filed earlier this month, it’s not difficult to see Abbott’s influence. 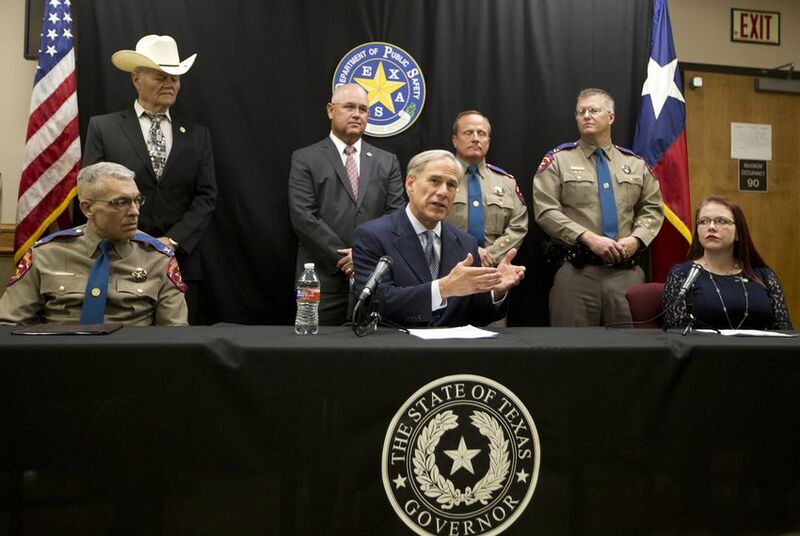 Kacal, who represents Allen’s hometown of Mexia, stood behind the governor at an August press conference in Waco where Abbott first called for legislation that he said would keep dangerous people like Allen’s murderer off the street. The governor’s proposal included creating a system that considers criminal history and the safety of law enforcement when making bail decisions, and it would allow only district judges, not lower-level magistrates, to set bail for all felony and violent misdemeanor crimes. The governor also acknowledged at the time that his proposal, though primarily focused on keeping “violent criminals off our streets,” could become an avenue to keep poor people who aren't dangerous out of jails as well, potentially by using a risk-assessment tool. Under the Texas Capitol, there is also a slew of other bills on the subject that have been filed, aside from the dueling Allen bills. A couple of bills mainly address the recent federal opinions that called county practices unconstitutional by requiring individual bail hearings within 48 hours for those who claim they can’t afford automatically set bail amounts. Officials from the powerful bail bonds industry, which collects a percentage of the bail amount from defendants to front the total cost and which Whitmire has said killed past legislation because of fear it will cut into profits, said they could support such a proposal, but they are concerned with the risk-assessment portion of the bills. At least one other bill would default to release from jail on no-cost bonds for all defendants charged with nonviolent crimes. And although Whitmire and Murr’s bills appear to have more advocacy support and legwork behind them, advocates across the nation have also criticized practices included in their measures, like allowing judges to fully deny bail and risk-assessment tools in general. Measures passed in California and Maryland leaned toward preventive detention for high-risk defendants as well, and in California, some advocates have since pulled their support for the legislation, claiming that risk-assessment tools can be racially biased and that judges have too much discretion to deny bail altogether and keep people locked up. In Maryland, reports have shown that a rule meant to reduce the jail population and use of cash bail led to judges opting more often to keep people in jail rather than release them on no-cost bonds. Disclosure: Texas Appleseed and the Texas Public Policy Foundation have been financial supporters of The Texas Tribune, a nonprofit, nonpartisan news organization that is funded in part by donations from members, foundations and corporate sponsors. Financial supporters play no role in the Tribune's journalism. Find a complete list of them here.